As of January 2016, there were more than 8 million pupils attending over 23,000 schools across the UK. This growing number has long caused concern over class sizes amongst industry experts, but many of the country’s largest schools have seen their GSCE grades steadily improve over recent years. The improvement of secondary school grades has long been approached from the angle of resources and teaching, but a recent study has revealed that the design of a classroom could affect the academic success of a child over a year by up to 25 per cent. Based on a year-long study of 751 pupils, carried out across seven primary schools, research conducted by the University of Salford School of the Built Environment, revealed that 73 percent of the variation in pupil performance at class level can be explained by building environmental factors. 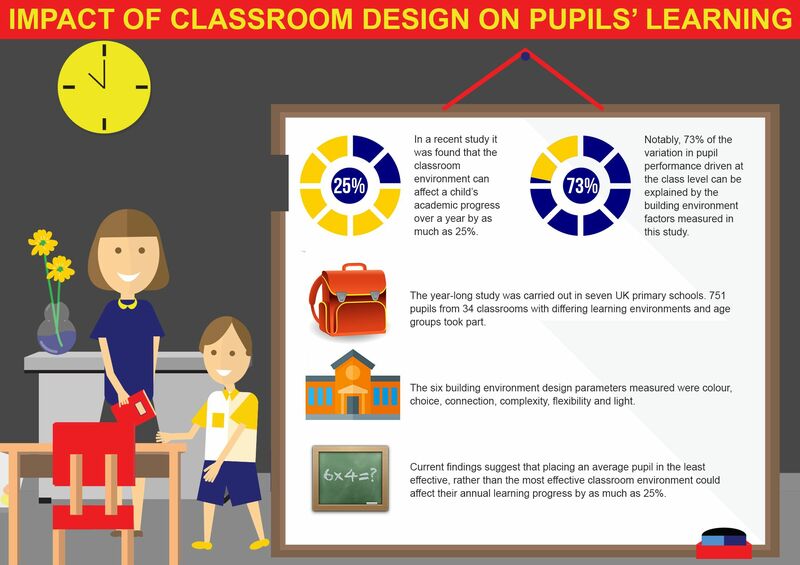 These results have been reflectedin a similar study conducted by the Royal Institute of British Architects (RIBA), which found that 90 per cent of teachers believe well-designed schools enhance grades and student behaviour. The study also highlighted the effect of school design on teacher satisfaction, noting that one in five teachers have considered leaving their position over school conditions. Motivated by the apparent impact of design on pupil performance, the government responded to research with the introduction of the Building Schools for the Future (BSF) Programme, which was announced by the then Prime Minister Tony Blair in 2004. Tasked with “renewing the secondary school estate”, the BSF Programme was a £55 billion project that aimed to rebuild or refurbish each of the 3,500 secondary schools in England by 2020. Upon the project’s launch, government suggested the BSF marked a step-change in children’s education, providing inspirational buildings that were fit for 21st Century learning. Former Education Secretary Michael Gove eventually scrapped the programme in July 2010, but not before it had overseen the refurbishment of 178 secondary schools. The majority of the schools that have undergone refurbishment through the project have had their learning transformed by a central focus on building a greater sense of school community. Featuring grand atriums, busy ‘streets’ and naturally-lit walkways, many of the schools are designed to lead all pupils back to a building’s chosen hub, where much of the community atmosphere is centred. One of the biggest success stories of the BSF Programme is that of Kingsdale Foundation School, which has grown into one of the most popular and successful secondary schools in London and indeed the UK. Built as a London comprehensive in 1958, Kingsdale has undergone an extensive £30 million redevelopment project as part of BSF, and in 2010 it was named an outstanding academy convertor school. Some of the school’s most significant features include a generous central atrium, aerial walkways and the world’s largest “variable skin” ETFE roof enclosure, which surpassed even the Eden Project in its size. Following its redesign the school has also celebrated significant academic success, and in 2015 it was named the top performing state school in the London Borough of Southwark. Elsewhere in the world, similar initiatives inspired by research into the power of school design have also resulted in award winning projects. The Råholt Secondary School has become one of Norway’s most notable academic success stories, earning worldwide acclaim for revolutionising the methods used to teach pupils. Although famous for its three brightly coloured towers, the school’s most significant change is its new village design, which leads pupils around the school using main streets, open squares and gardens. In contrast, the Ørestad College in Copenhagen has focused on spiralling staircases and learning zones lined with orange beanbags to encourage flexible, open learning. The school was also designed to promote more independent learning, as well as team or group teaching. Although government officials continue to question the efficacy of futuristic school design on the success of pupils, global success stories highlight the potential impact of such projects on grades. Kingsdale Foundation School is just one example of a school that has evolved through design to become a hub of learning and success, and could perhaps prompt the start of a new era for UK school design focused on forward-thinking community learning. This entry was posted in Blog, Uncategorized on August 9, 2016 by admin.